The 544K Series 5N Swing Loader is a swing crane designed for Third Rail Systems. 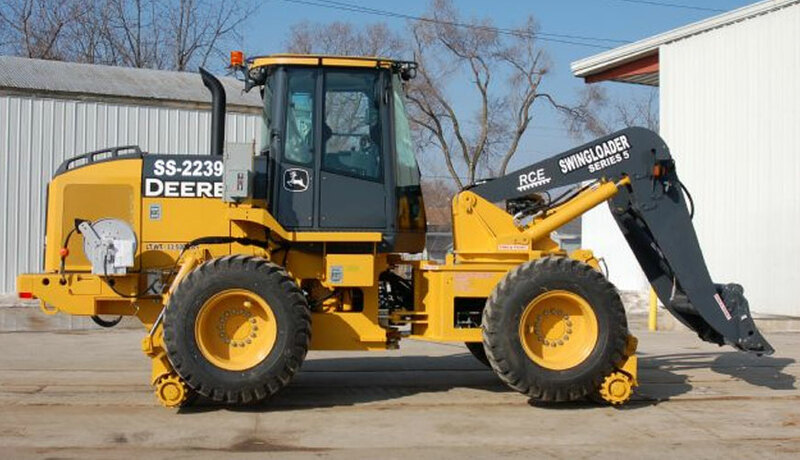 Using a Deere 544 size wheel loader rear section and a custom front chassis that has been modified to work on the rail, this Series 5N has all the power required to handle your railroad maintenance needs. Designed specifically for Third Rail applications, the Series 5N has a narrowed high rail axle and tire to keep the width down. The standard loader boom and housing has been replaced with a 200 degree turntable that allows the operator to accomplish swing crane functions. The main boom assemble retains its structural integrity allowing the Series 5N to accomplish wheel loader function with 14,500 lbs of lift capacity. Equipped with the high traction axles, the Series 5N has enough drawbar pull to handle the positioning of continuous rail. Whether working on or off rail, the Series 5N Swing Loader provides a powerful, safe machine that offers the reliability of John Deere loaders and the ultimate in swing crane technology.